Everything about this Friday morning was better than Thursday. 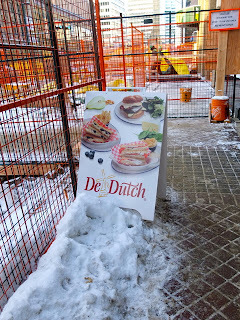 I wasn't woken up at 6am by my neighbour blasting music, my building had plenty of hot water, the weekend was only hours away, and I had plans to visit De Dutch before heading to work. 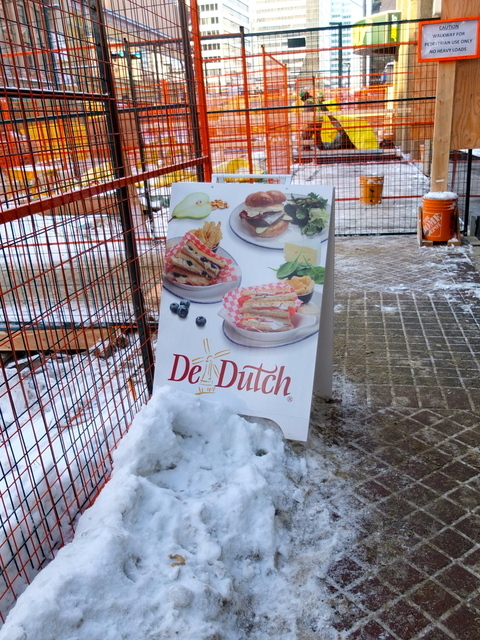 De Dutch, a Vancouver-based chain of restaurants specializing in Dutch pancakes opened its first location in Edmonton a few weeks ago. The location is on the North side of Jasper Avenue, in the construction zone between 100 and 100a Street, most convenient to the Central LRT station, or the Scotiaplace Parkade. While I'm sure the weekends at De Dutch are bustling, on our weekday mid-morning visit the restaurant was quiet and we were seated immediately. The restaurant is larger than it appears with from outside, with a back section as well as a board room. If you have the option, request a seat in the back of the restaurant in the winter months. I kept my coat for the duration of our visit because of the chilly draft from the entrance wafting through the front section. Considering the restaurant is open only for breakfast and lunch (7am-3pm weekdays; 8am-3pm Sat & Sun), the menu is massive. Along with sweet and savory Dutch pancake options, I found more traditional breakfasts, omelettes, french toast, and bennies as well as burgers, sandwiches, wraps, and tosties (toasted cheesy sandwiches). A Dutch pancake, or pannekoek, is larger and thinner than a typical North American pancake. The pannekoeken at De Dutch are 12" in diameter, and are served open and topped with your chosen accompaniments. My Amsterkoek, pictured above, was topped with Edam cheese, ham, two eggs, and hollandaise sauce. After pouring the sauce over the innards, I rolled up, and dug in! The pannekoek had a wonderful texture, closer to a substantial French crêpe than to a typical pancake. Edam, one of my favorite cheeses, contributed a mild flavour and slight saltiness that helped bring this hearty dish together. I was a bit disappointed not to find any gouda in their large menu, as I think its creaminess and ability to shred and melt so nicely would have made it an even better choice than the Edam on this pannekoek. The strawberry cheesecake pannekoek was more like dessert than breakfast after the Amsterkoek. 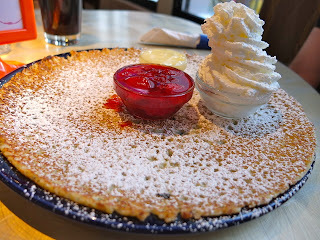 The pannekoek comes sprinkled with icing sugar as well as small cups of strawberries in syrup, a sweet cheesecake sauce, and whipped cream -- all the ingredients for a delectable sugar rush! My experience at De Dutch certainly didn't derail my morning. Along with the tasty food, the service was friendly and swift, our entire visit lasting only 45 minutes. If you're looking for a variation of your breakfast (or dessert!) 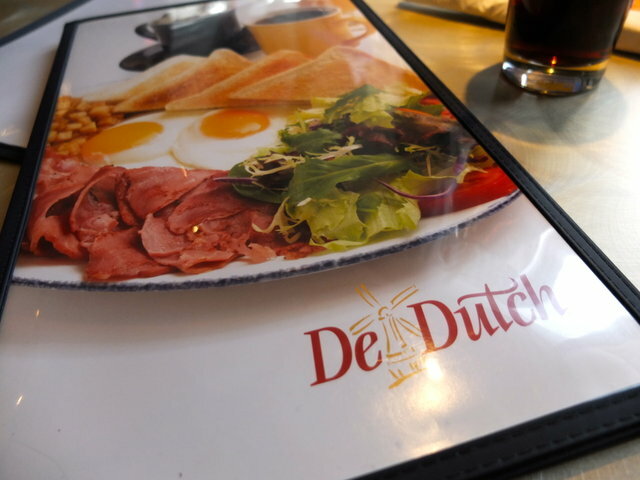 favorites, all rolled up in a pannekoek, De Dutch is certainly worth a visit!